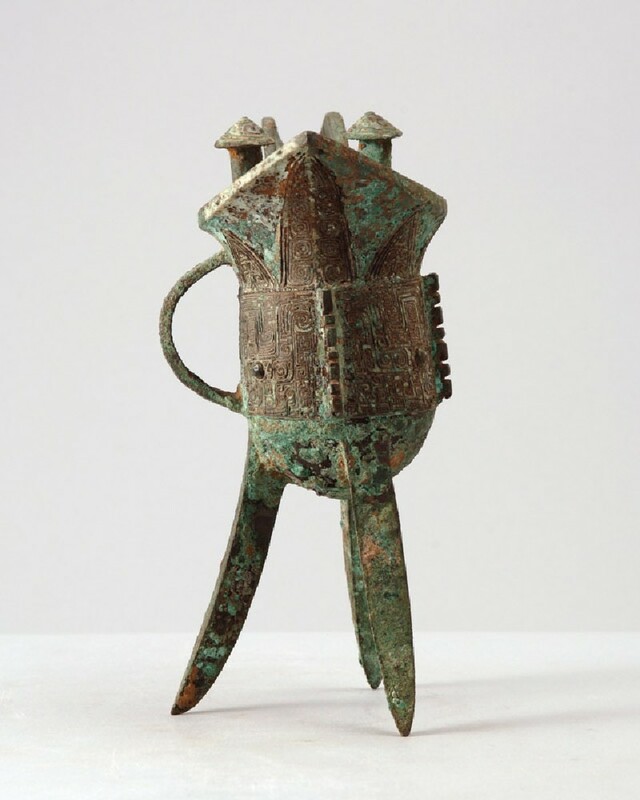 Chinese bronze ritual wine vessel. Similar pieces were discovered in the tomb of Lady Hao, consort of king Wu Ding, at Anyang, Henan province, who was buried with very rich provisions around 1200 BC. The piece has a very deep U-shaped cup, raised on three pointed, slightly curved triangular legs, and terminating in a long chanelled spout, flanked by two vertical posts, opposite a pointed collar. The cup has a curved handle with a pictograph underneath, and is decorated with a broad band of taotie designs, the masks composed of fine linear scroll motifs with prominent boss-shaped eyes, centred on and separated by notched flanges. Above the band are triangular cicada motifs, which extend into elongated blades under the spout and collar. The posts are flat on the outside and curved on the inside, capped by conical tops decorated with spiralling motifs. The piece is thickly encrusted with green patina. The pictograph is a clan sign in the shape of a dog.